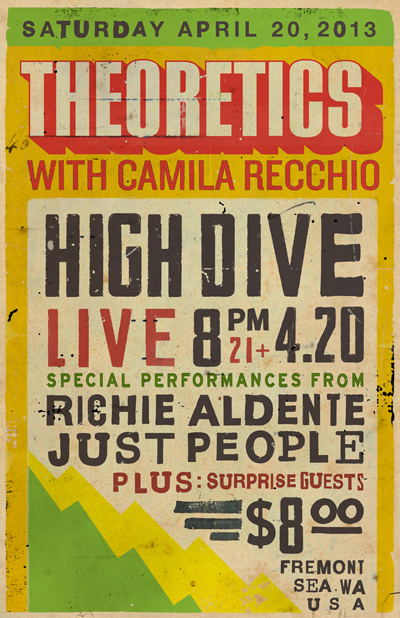 Continuing in our series of poster work for Seattle Hip Hop band Theoretics... FYM recently created the design above for their 4.20 show at The High Dive in Fremont! Theoretics continue to rise in 2013 with high profile appearances coming up at Sasquatch Music Festival and Capitol Hill Block Party this summer. Watch their recent TV performance on Seattle's weekly showcase of the arts (Art Zone with Nancy Guppy) above. 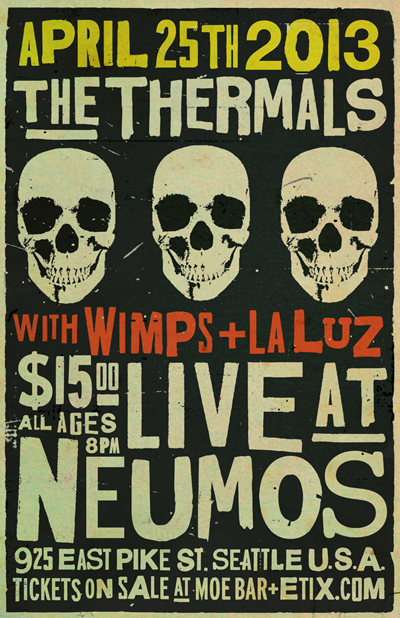 The next design in our recent poster work was a pleasure to create for Neumos. We first heard of The Thermals in 2003/2004 while discovering their flailing lofi pop/thrash gem More Parts Per Million on SubPop. After releasing several recordings on SubPop and Kill Rock Stars over the past decade, The Thermals are now calling Omaha's Saddle Creek their new label home. Watch their latest video for Born to Kill above. To purchase tickets to their show on April 25th click HERE. Cheers, FYM.